Every year on May 9, to commemorate the Soviet Union’s victory over Nazi Germany in 1945, Red Square is flooded with columns of vehicles, uniformed soldiers, and military aircraft flying at low altitude across the Moscow sky. RBTH looks at the months of preparation behind the scenes that go into making the event go without a hitch. 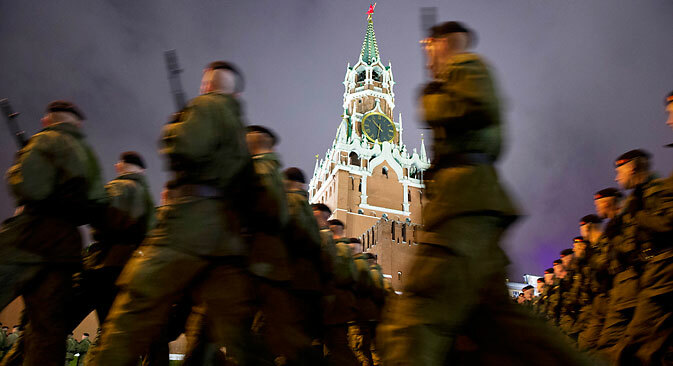 Every year on May 9, Red Square is flooded with columns of vehicles, hundreds of people in uniform parading across the cobblestones, and military aircraft flying at extremely low altitude across the Moscow sky. When the marchers synchronize their powerful measured steps to the sounds of a military march with every kind of armored vehicle slowly and menacingly following behind them, spectators admiring the event inevitably begin to wonder how it is possible that the parade participants achieve such impeccable consistency. Preparation for this, perhaps the most grandiose event designed to show the art of military bearing and the power of modern technology, begins in the fall. Military universities, schools, and units select the most worthy cadets and conscripts who have excelled in school and drill training. Individual features do not really matter as much as the overall group appearance, which should consist of tall young men who look alike. The future parade participants are taught to move correctly. They take 20 steps per minute, with each step measuring 90 centimeters. The passage of the entire column of 11,000 people takes 15 minutes. The servicemen are required to maintain rank in precise and straight lines, and keep step, all the while carrying banners, musical instruments, and weapons, without stumbling. The chief in the ranks marches to the right. He determines the width of the step and the distance between lines, and strictly keeps the pace. All the other soldiers in the ranks must see the chests of the four people to the right. The marchers keep their elbows at a certain angle to maintain an equal distance between them. Another secret to maintaining the correct movement is the use of so-called “bells,” which are fastened to the marchers’ military boots so they make a louder sound against the cobblestones. This sound makes it easy to determine whether or not the unit is moving correctly. The marchers begin training in rows of 20. As soon as the soldiers are able to march in step, they begin to form the so-called parade unit, consisting of ten rows of 20 people each. It is this formation that the audience will then see at the parade. Each branch of the armed forces must be represented by three units of 100 people, excluding officers. In early spring, the parade participants leave their “home” grounds a few times a week and are sent to a training ground that is a replica of Red Square. This is where the basic training for foot soldiers, mechanized columns of vehicles and aircraft, as well as a full parade program rehearsal, take place. Retired Captain First Rank Yury Charushnikov told RBTH that the drilling is so intense that marchers sometimes faint. Not everyone is able to stand motionless at attention for an extended period of time. The one solution to this problem is that liquid ammonia ampoules are crushed within each parade unit, just in case. The terrible smell invigorates and immediately helps participants recover. The soldiers driving the military vehicles have different problems. Tank drivers and drivers of surface-to-air missile trucks are trained to drive their vehicles in one straight line, hold that line to the nearest centimeter, and move at the same speed as everyone else. In the sky, aircraft flying in wedge formations must delicately maintain the distances between them and fly at a uniform speed. This is a daunting task, given that the aircraft involved in the parade have varying flight characteristics but must all fly at the same speed and altitude. After parade participants have rehearsed on the training grounds to the point where they are able to perform automatically, they await their dress rehearsal on Red Square. A couple of days before the actual event, parts of Moscow’s central streets are packed with foot soldiers and heavy military vehicles, giving Muscovites a rare opportunity to see the hardware up close. The tanks and howitzers are clad in special rubber pads that prevent the heavy caterpillar machines from damaging the asphalt and cobblestones. Additionally, onlookers can observe the flight of the graceful Tupolev Tu-160, a huge Antonov AN-124 Ruslan, a heavy Antonov AN-22 Antaeus, and even an A-50 reconnaissance aircraft with a saucer radio complex on board, all in the same ranks and at a height of 300 meters. Months of grueling training have come to an end. Troop movements during the dress rehearsal have verified there is nothing to worry about: The May 9 Victory Day Parade, a tribute to tradition and a demonstration of military might, will once again go smoothly. The parade strictly meets military protocol, beginning with the formation of the troops. They then present the national flag of Russia and the Victory Banner. Protocol also determines the music to be played while all this occurs. Specifically, it calls for the song by Alexander Alexandrov, Sacred War. The minister of defense oversees the parade. The parade commandant reports to him about the readiness of the troops, and then sends the commanders in ZIL-115 limousines to welcome the troops. Drummers from the Moscow Military Music College open the parade. They are followed by cadets from the Moscow Academy wearing World War II uniforms. These are followed by representatives of the various military branches. The parade is closed by cadets from the Suvorov Military Schools, which are specialized institutions for school-age students.